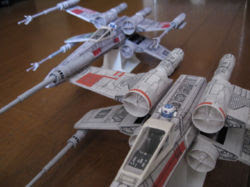 Here's another great looking papercraft from Star Wars. You need to print ten pages of parts for this one. can u find color pattern ?? because this patterns don't have a color on them. ignore about what i just said, i already figured it out how to make them color full. tq again for all your papercraft i really appreciated. It would be nice for someone to make pdf pages from the pdo sections because the names of the texture sheets don't match up to the pdo parts..
someone needs to do pdf sheets of this pdo model because the texture sheets are'nt the same name of the pdo sections which can lead to an incorrectly skinned model..
well, i've tried to convert it into pdf, however it did not converted correctly.